Dr. Matt Ritter teaches botany at Cal Poly San Luis Obispo, and luckily for us non-students, he also lectures up and down the state of California and occasionally writes books and articles. His knowledge and passion for plants, and especially trees, is contagious when you get to hear him in person. That passion and knowledge also runs through his writing. His previous book, A Californian’s Guide to the Trees Among Us (Heyday 2011) illustrates this perfectly. This easy-to-use guide can help anyone identify and learn about the trees in our urban forests and was loaded with fascinating information as well as enthusiasm and humor. 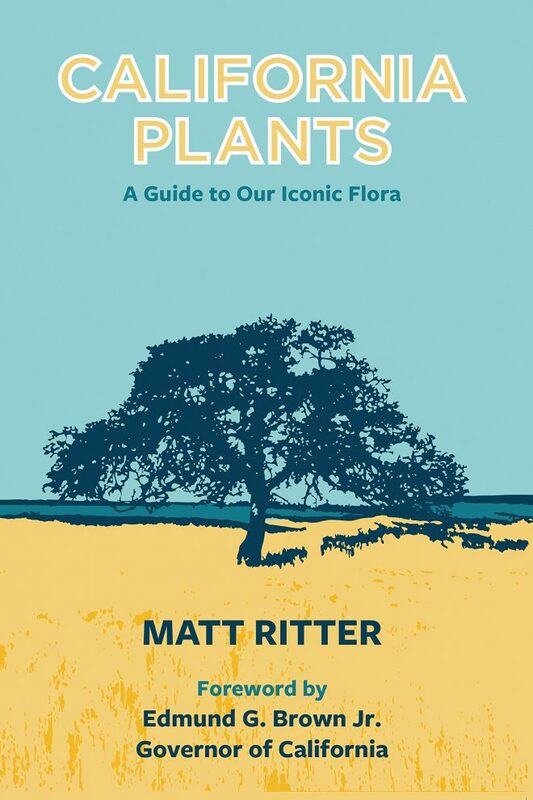 Dr. Matt’s new book, California Plants: A Guide to Our Iconic Flora is a guide to the flora of the state of California. The forewords to the book by Edmund G. Brown Jr., Governor of California as well as David Myers of the Wildlands Conservancy, and Dan Gluesenkamp of the California Native Plant Society all speak to the incredible diversity of the state’s plant life and the challenges presented by land use, climate change, and habitat loss. This new guide is beautiful to look at. The plant profiles are arranged by habitat, giving us the most commonly found plants and trees found in each community. From the deserts to the coast and from the grasslands to the mountains we are introduced to the “cast of characters” we would be most likely to meet if we were hiking the area. The most pertinent information is presented along with interesting facts about plant distribution, morphology, and even ethnobotanical uses by native peoples. This book will be a welcome treasure trove to anyone new to the flora of California and will also add richness of knowledge to those already more familiar with the amazing flora of the state. We often travel to far-flung corners of the earth seeking out hotspots of biodiversity, quite forgetting that there are rare and beautiful things growing just beyond the edges of our civilized world. Many of the plants presented here are found nowhere else in the world and Dr. Matt Ritter keeps that sense of wonder present on each page of this book. Grab your hiking boots, a water bottle, and this guide, and enjoy.